Overview - This cornerstone of 1970s American moviemaking from Robert Altman is a panoramic view of the country's political and entertainment landscapes, set in the nation's music capital. Nashville weaves the stories of twenty-four characters—from country star to wannabe to reporter to waitress—into a cinematic tapestry that is equal parts comedy, tragedy, and musical. Many members of the astonishing cast wrote and performed their own songs live on location, which lends another layer to the film's quirky authenticity. Altman's ability to get to the heart of American life via its eccentric byways was never put to better use than in this grand, rollicking triumph, which barrels forward to an unforgettable conclusion. "You may say I ain't free, but it don't worry me." When it comes to traditional Hollywood moviemaking, there are certain rules that most writers and directors try to follow. Rules pertaining to structure, plotting, editing, shooting, and characters that help keep stories firmly planted within a three act structure carefully designed with clear-cut arcs, setups, and payoffs. Rules that keep storylines cohesive and tightly focused. Rules that excise unnecessary diversions and seemingly unimportant beats. Robert Altman's 1975 masterpiece, 'Nashville,' does not follow any of these rules. In fact, it pretty much breaks them all -- making us question why the hell we adhered to them in the first place. A meandering, sprawling, and utterly unique blend of comedy, drama, and musical, the movie does just about everything you're not supposed to do, and it makes it all seem so natural. Subversive, satirical, hilarious, thought provoking, oddly moving, and amusingly over-bloated, this just might be the most quintessentially American film ever made. The loosely flowing narrative focuses on twenty four eccentric characters as they maneuver their way through the Nashville music scene over the course of a few days. While they interact and cross paths with one another, various subplots begin to take shape, chronicling mental breakdowns, illicit affairs, fragile ambitions, big opportunities, heartache, and crushed dreams. Throughout it all, a political campaign hangs ever present in the background, subtly informing the numerous storylines until they all collide at a climactic rally and concert. A quasi-documentary style that uses frequent wide shots, zoom lenses, multi-track dialogue recording, and a fitting reliance on improvisation all help to maintain an air of unpredictable reality, and while the film can veer toward the exaggerated and satirical, this approach always feels natural, authentic, and believable. The packed ensemble often speaks over one another, and we spend many scenes simply cutting between different groupings of characters, getting little snippets and pieces of disparate conversations that somehow add up to form a greater (and often hilarious) whole. The seemingly unimportant asides, throwaway lines, and secondary interactions that might otherwise hit the cutting room floor on most productions, actually become the main emphasis here, creating a fragmented mosaic of unconventional storytelling. Don't get me wrong, there are still clear subplots and deliberately designed narrative threads layered throughout the complex runtime, but Altman and screenwriter Joan Tewkesbury seem completely disinterested in traditional three act structure, avoiding usual dramatic construction to instead turn their focus on all the amusing periphery moments that rest in between the significant beats. This leads to a kind of overflowing collage of plot, dialogue, and cinematic texture that inexplicably manages to turn good old fashioned meandering into a cohesive art form. Specific characters serve as our connecting tissue, helping to bridge the gap between locations and events, and all the while we are treated to a healthy assortment of extended musical numbers. The cast actually writes and performs the majority of their material, and all of the country/western and folk songs are fantastically realized, hitting just the right note between sincerity and faint parody. The entire ensemble really does an absolutely fantastic job, both on the stage and off, and each actor creates a unique persona that is brimming with personality. Standouts include Geraldine Chaplin as a pretentious BBC reporter (or at least, that's who she claims to be), Keith Carradine as a womanizing folk rocker, Lily Tomlin as a sweet gospel singer who flirts with temptation, Henry Gibson as an old fashioned country superstar, Ronee Blakley as an angelic but mentally frail vocalist, and -- well, honestly I could just go on and on. Each member of the massive twenty four piece ensemble really is that good, bringing effortless laughs, great music, and genuinely stirring emotion to the screen. Though the movie is entrenched in Nashville culture, the reality is, Altman's film really isn't about country music at all, and one certainly doesn't need to appreciate or even be interested in that world to enjoy the picture. Hell, it might actually help if you're not a fan. Presenting the 1970s Nashville music scene as a microcosm for our country as a whole, Altman uses his eclectic cast and meandering plot to scrutinize the contemporary American landscape. Through metaphor and satire, concepts dealing with success, fame, obsession, ego, delusions, patriotism, and politics are all intermingled into a farcical examination of all things red, white, and blue. And though the film's shocking finale speaks volumes, the movie mostly avoids tackling any one specific political or cultural message. Much like its sprawling narrative, the film's themes are similarly vast and varied, refusing to say anything too explicit. Instead, Altman simply offers an overarching interpretation of America -- one that happens to be filled with many of the same quirks and problems that we still face today. Like any truly unique work of art, it's actually rather hard to really describe 'Nashville.' On the one hand, Altman's approach to moviemaking and storytelling is radically atypical, but on the other hand, the results remain effortlessly natural and entertaining. Palpably funny and tragic, the film offers a bizarre blend of music, comedy, and social commentary, creating a singular reflection of our nation that is simultaneously cynical and celebratory. A defining piece of uniquely American cinema, the movie remains one of Altman's best films (though 'The Long Goodbye' is my personal favorite), perfectly encapsulating what makes his approach to directing so unruly, distinct, and mesmerizing. Critical but not quite mean-spirited, the film is a sardonic yet still sympathetic testament to our country's flaws and strengths -- a jumbled, messy masterpiece of Americana, fueled by an equally tenacious and delusional spirit that's somehow always ready to pick up the microphone and play on. 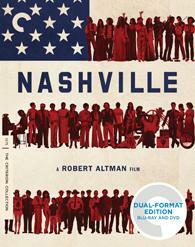 Criterion presents 'Nashville' in a Dual Format Blu-ray/DVD combo pack. A BD-50 Region A disc and two DVDs come packaged in a foldout case housed in a cardboard slipcover with spine number 683. A booklet featuring an essay by critic Molly Haskell is also included. The movie is provided with a 1080p/AVC MPEG-4 transfer in the 2.35:1 aspect ratio. Authentic and nearly pristine, this is a wonderfully filmic and respectful video presentation. Outside of some fleeting specks and negligible scratches, the source print is in fantastic condition with no major signs of age or damage. A moderate to heavy layer of natural grain is present throughout, giving the image some pleasing (albeit slightly fuzzy) texture. Though never razor sharp, Altman's wide compositions are brimming with detail, highlighting all the colorful costumes and Nashville locations. Outdoor sequences are home to some pleasing dimension, but the heavy use of long lenses does lead to a comparatively flat appearance in several scenes. Likewise, certain shots are softer than others, but these issues all seem to stem from the original shooting methods. Colors are nicely rendered though a tad muted, but primaries are particularly bold, offering solid pop. Contrast is nicely balanced, and while there is some minor pulsing in shadows, blacks are steady and deep. Free from any age-related issues or unnecessary digital manipulation, 'Nashville' comes to Blu-ray with a lovely high-def transfer. Though the image can be a little uneven, that's simply the nature of the material. Criterion has done a great job here and fans should be very happy with the results. The audio is presented in an English DTS-HD MA 5.1 track along with optional English subtitles. Fueled by a great selection of original songs, this is a strong mix that does all the music justice. Altman and his crew went out of their way to mic as many actors as possible at a time, and their innovative recording techniques pay off well. Dialogue is clear and easy to understand, picking up lots of great throwaway lines and background comments throughout, adding an extra sense of character to the proceedings. Likewise, effects work feature a decent sense of directionality and space with some appropriate pans here and there and a solid air of ambiance that brings the hustle and bustle of Nashville to life. With that said, the design work is relatively restrained and front-loaded. Thankfully, the track really perks up during the film's numerous musical performances. The songs all come through with strong range and separation, filling the room with sound. Low frequencies kick in nicely during some of the songs as well, and balance between all of the audio elements is handled well, placing the emphasis appropriately on dialogue or music. Criterion has put together a fantastic collection of supplements, including a commentary and retrospective documentary. All of the special features are presented in upscaled 1080i with Dolby Digital 2.0 or 1.0 audio (unless noted otherwise). Commentary with Director Robert Altman - Recorded in 2000, this is an informative but occasionally dry track from the late, great director. Altman wastes no time and gets straight into his discussion, touching upon production trivia and anecdotes about the main title sequence, casting, song writing, political campaign, and genesis of the story and individual scenes. There are a few lengthy gaps here and there but it's still great to hear Altman's thoughts on his film. The Making of Nashville (HD, 1 hr and 11 min) - Produced by Criterion in 2013 and presented in 1080p, this is a new retrospective documentary about the film's production. Interviews with the cast and crew, including Keith Carradine, Lily Tomlin, and screenwriter Joan Tewkesbury are included, and the participants spend a lot of time discussing how they got involved in the project and what it was like to work with Robert Altman, elaborating on his unique directing style. Filled with worthwhile insights, this is a much watch for fans. Robert Altman Interviews (HD) - Separate interviews with the director from 1975 (25 min), 2000 (13 min), and 2002 (8 min) are included. The director discusses the story's genesis, his directing approach, the movie's unconventional narrative structure, and use of improvisation. Though some information is repeated throughout the interviews, they all offer a few interesting bits. Behind the Scenes (HD, 13 min) - Here we get some rough on-set footage without sound taken during the shooting of the traffic jam scene and the film's climax. Keith Carradine Demo (HD, 12 min) - This is a recorded audio demo of Carradine singing "I'm Easy," "It Don't Worry Me," and "Big City Dreamin'." Images of production photos and documents play out over the music. Robert Altman's 'Nashville' is a defining masterpiece of American cinema. Through its singular mishmash of comedy, music, and drama, the film offers a sprawling, hilariously satiric look out our country's complicated culture and politics. This disc from Criterion features great video and audio presentations, respectfully preserving the filmmakers' intentions. Supplements are also comprehensive, with a fantastic retrospective documentary and even a commentary from the director himself. This is an exceptional release for a truly unique and innovative film. Highly Recommended.